When it comes to wedding theme ideas, there is no colour combination other than black and white which has stood against the test of time. This classic colour combination, when used for your wedding theme, looks stunning, elegant, and chic. Instead of abiding by the traditional rules of wedding, just go ahead and try classic black and white wedding ideas for a memorable wedding celebration! Setting up a black and white theme is simple. You already contribute towards the theme with the selection of your wedding dress. Your groom will be all decked up for the occasion with an elegant black and white tuxedo and now it is so easy to add the white colour combination with your beautiful white wedding dress! For more impact, you can add a hint of black to your attire with something as minimal as a black sash. Not only will you get raving reviews about your wedding decor, but also your bridal party and other guests will thank you for choosing a basic yet elegant colour scheme, as it will be easier for them to shop for the occasion. A simple black dress is always welcomed in any wardrobe! However, the dresses are only one part of the theme, there is much more to follow, so read on. Another factor is the flower decoration. These days, flowers come in all shapes and sizes and not to forget the shades. 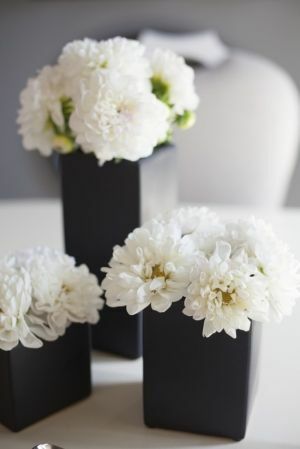 Finding an arrangement of white is a simple task. Black flowers are not available, so you can accent them with an elegant black vase or a beautiful black ribbon, and Voila! You will have an aesthetic splash of black and white hues throughout the venue. However, for a perfect black and white wedding theme, you cannot afford to just limit yourself to floral centre pieces, but you need much more. For more splashes of these two colours think creatively while creating table assignments. 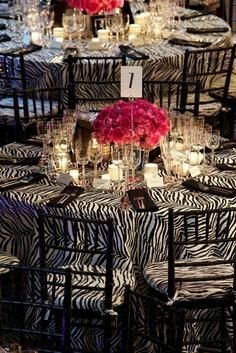 Instead of numbers, use animal table ideas like "Penguin Table" or "Zebra Table." To add a personal touch to the venue, you can also add some of your favourite pictures with your partner, friends and family printed in black and white on the tables or scatter them aesthetically around the venue. Since most of the venues, caterers and event managers offer white or ivory linens, you can also consider printing name cards or wedding dinner menu on black card stock to contribute more to the theme. To add more twist to your theme you can also consider sending out beautiful wedding invites to the guests printed in black and white. Also, keep the colour code for the occasion as black and white and allow a hint of red for more drama! A black and white theme will not only stand out but will stand out exceptionally well! Looking back at your wedding pictures after years of togetherness will bring back beautiful memories of the occasion to you. This theme will ensure that your wedding celebrations is carried on with ultimate style and splendour!